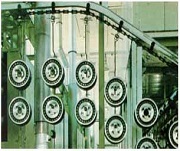 Each industrial application is usually a unique application. We will work with you to provide a booth that is integrated in to your overall workflow. 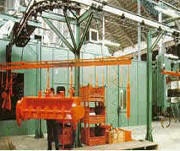 Industrial applications often move work through their facilty with some type of material handling systems. 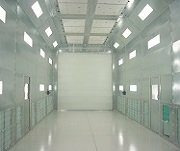 Whether you use 3 axis cranes, overhead conveyor systems, floor rail systems, or any other type of system we will work with you to provide a paint booth that will fit your process. As part of our service to you we will co-ordinate our information with your architects, engineers, and general contractors. 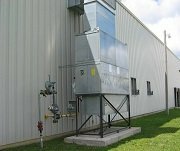 We offer complete turnkey systems including air handling and conveyor systems. Creative engineering and attention to detail will ensure that you get the right system and equipment for your application. 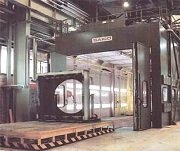 We can provide a turnkey finishing system with your paint booth integrated into the entire finishing process, from blasting, to painting, to drying, to material movement systems like cranes and conveyors. We work with many specialty equipment manufacturers to provide complete turnkey systems. We take pride in the ability to provide the best equipment for your unique application. Whatever your requirements we can design a system for your business. Open face booths offer the convenience of easy access. They are ideal for applications in which fume control, odor control, or overspray control are desired and/or required. We can make open face booths with crane slots for use with overhead crane systems or with conveyor openings for use with different types of material handling and material conveyance equipment. 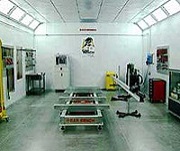 We offer booths with HEPA air systems to move air back into the shop after being filtered as well as booths that exhaust to the outside of the building. Booths exhausting to the outside of the building may require air makeup units to replace the air exhausted by the booth. We can also provide an air makeup system to replace the air exhausted by your booth if your application requires exhausting to the outside of your building. We offer standard open face booths in a variety of sizes, 7' Tall, 8' Tall, 10' Tall, and 12' Tall. Standard widths run from 4' to 20'. Standard depths run from 5' to 15'. We can also fabricate a booth to your exact custom dimensions for your specific application. To See a Listing of our Standard Open Face Booths Click Here. 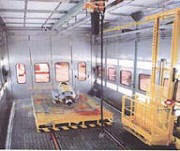 Enclosed booths completely isolate the work area from the rest of your facility. Basic crossdraft booths have filtered front doors. The air comes in through the filtered doors moves through the work area and is drawn though a filtered exhaust plenum at the rear of the booth and to the outside of the building through exhaust duct. 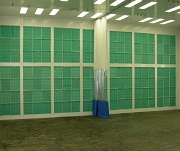 Some applications may allow for using booths with HEPA air systems to move air back into the shop after being filtered. Exhausting inside or outside is dtermined by the chemical properties of what is being used in the booth along with the amount used per application period. Booths exhausting to the outside of the building may require air makeup units to replace the air exhausted by the booth. We can also provide an air makeup system to replace the air exhausted by your booth if your application requires exhausting to the outside of your building. We can also connect an air makeup sysytem directly to an intake plenum on a booth to provide a system that is a "closed loop". 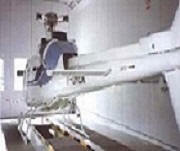 Air comes directly from outside the building trhough the air makeup unit which is connecting by ducting directly to the intake plenum on the booth. This allows for having a cure or bake cycle for your booth and also allows for control the pressure in the booth. 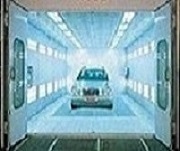 Standard Automotive Size Booths Click Here. Larger Equipment Booths Click Here. 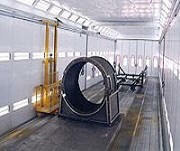 Our replacement air systems are designed to replace air exhausted from parts of the paint finishing process. They replace air exhausted from paint booths, grinding booths, chemical application booths, blast booths, and any other process that may be exhausting air out of your building. We offer systems that interlock directly with exhaust fans and systems that sense changes in the building pressure as exhaust fans from different items come on and off. It will maintain a constant even pressure in your building. The burner only engages when the temperature is below your preset. During warmer months it provides fresh air directly through the blower. Our heat and cure systems are designed to help you move your work through the process as quickly as possible. We offer a basic heat and cure system and another system with heat, flash, and cure modes. The flash mode allows you to dry the paint between coats. Works great for both solvent and water based paints. We offer systems with full air flow in all cycles and systems that allow you to vary and preset the airflow for different cycles. Our variable airflow control systems give you precise control over the air flow when you are painting, flashing, and curing. Different tasks and different conditions require different airflow for optimum efficiency and quality. Air Replacement - Heat and Cure Air Makeup Click Here.